Enterprises tend not to view project management as a holistic process. Much like the disparate systems they have in place, they see a disparate collection of issues. They typically look to solve specific pain points with single applications. Rather than migrate an entire enterprise to a new system, they are looking to manage a problem spot and have it flow into a specific component (e.g., cost, human capital leverage, or how demand is driven) as needed. In many cases, however, the pain points are symptoms of a larger issue, and to remove them the situation must be viewed in the context of the full project life cycle. 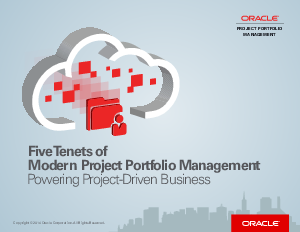 Oracle Project Portfolio Management (PPM) Cloud, part of the integrated suite that is Oracle ERP Cloud, not only does this, but it’s also built with the user in mind… solving the PPM pain points through role-based analytics, social collaboration, optimization, costing, control, and mobile solutions for today’s project team.